In 2007, I was approached by a middle-aged woman, who was a registered laughter therapist. She was part of the laughter movement, being led by Dr. Katari in India during the 1990’s. At first, I didn’t take her seriously. Yet, there was something inside me that felt drawn to her and what she had to offer. It seemed that, unbeknownst to me, there was a personal need for this in my life. We met informally, at a small, independent coffee shop on a quiet street in Vernon BC. It was an early Saturday morning and there were about eight other people in the shop. She explained to me what happens to the brain when we laugh and how laughter contributes to restoring mental well-being. She was very knowledgeable. She told me how laughter is contagious and if a few people within a group begin to initiate a playful, light-hearted, and fun-like atmosphere (like when you drink wine) organically, laughter will be the spontaneous by-product. The Doubting Thomas in me said “prove it.” Filled with confidence, she told me that she was going to start simulating laughter and that she wanted me to follow along with her. We started laughing and within about three seconds, everyone’s attention in the coffee shop was on us. Within eight seconds, two ladies at the counter started laughing. In less than fifteen more seconds, every person but one was laughing with us. In my opinion, this woman had passed the test. I ended up giving her a trial contract to come to the Alive Wellness Centre every Tuesday night for one month. She would teach our group members how children laugh over 100-200 times a day, while studies of adults show that they laugh less than 15 times a day and she told us why. We learned that in the 1800’s, British ladies, who laughed outload in public, were considered coarse and rude. If they had to laugh, they were supposed to put their hand over their mouth and chuckle very softly. We also discussed how some parents will get irritated with the noise from their kids laughing and playing. The children would be scolded and told to be quiet. She also taught us that the brain doesn’t know the difference between simulated laugher (fake laughter) and real, authentic laughter. The woman would then have us all stand up and begin motor-boat laughter, followed by stomach laughter, and then deep gut laughter. We would, at the same time, walk around the room, putting our hand on someone’s shoulder, while looking at them. It turned out to be a very engaging exercise. This method of treating patients suffering from a mental health struggle was effective then and it still is today. Ten years later, laughter therapy is one of the most effective treatment modalities of the 10 that we practice at the Alive Wellness Centre. When a new group session starts, it is indeed a struggle to move the group into this playful, light-hearted, and fun-like attitude that becomes the fuel that ignites laughter. Usually, depending upon the temperament of the group, within no more than 2 or 3 days, the group is eagerly engaging in this activity. As our clients work on learning how to change unhealthy thoughts and emotional patterns to more healthier ones, laughter creates an inner strength for change. It’s a strength that floods the brain with feel-good endorphins, which helps them succeed. Additionally, it helps our clients learn the many benefits that await them as they overcome their mental health struggle. After all, the desire to experience playfulness, light-heartedness, fun and laughter is intrinsic to the human experience. Just watch children and they’ll teach you how to tap into this part of yourself. As you begin, an intrinsic desire for more will be triggered. Think of someone you know who is easygoing and easily plays and laughs a lot. Those people have an energy and enthusiasm that attracts and draws us to them. We find ourselves wanting to be close to them. In addition, we get can sense their mental well-being. Likewise, when you hear people laughing, there is a natural curiosity that grabs your attention and makes you want to be part of it. Healthy laughter just seems to have something right and beautiful about it. Take a moment to do this survey and discover some new things about yourself in this regard. 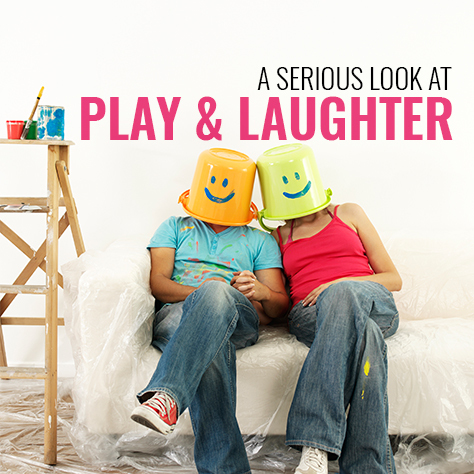 Then make the deliberate decision to increase your play and laughter today.